Kelly's Korner: Show Us your Life - Fall Decorations! Show Us your Life - Fall Decorations! First of all - last week was a great success!!! I hope you all enjoyed shopping! I'm going to keep that post up over on the Show Us your Life blog! (I haven't put it up yet but it will be soon!) I thought maybe we could do that every 3-4 months! It's a great way to feature Moms who make stuff and a great place to get good finds! Well - I don't really decorate for fall. This is about the extent of it. In fact I forgot to take a picture today so this was last year and this year I haven't even bought mums yet (mostly because I can't figure out how in the world I would get big mums and Harper around in a store). I LOVE fall but I'm just not big on decorating for it. But I'm SO ready to get going on Christmas. I realize it is going to be insane this year with a little monkey in my house who is into everything but I'm going for it anyway! But I can't wait to see your fall decorations ...............maybe you will motivate me for next year! I'm with you on getting excited about Christmas decorating. We have a new cat...which should be interesting when the tree goes up. Can't wait. I'm not doing much for fall this year- I have a fall basket out for the children full of books and activities. We have our annual "Pumpkin Day" coming up, too. I'm new to the party, so it will be fun to see what everyone's done! You've got more than me. LOL. I have my goodies on the kitchen counter and in the garage. I've been meaning to decorate all week and I haven't gotten to it. I'm going to try and motivate myself tomorrow to get organized, so I can do my post. on saturday, give that girl to her daddy and go get mum's from home depot. last week they were $10, huge and beautiful. at least in atlanta! I just caught up on all your posts. LOVE LOVE LOVE all the pictures of Harper. My favorite are the pumpkin patch pictures... too cute! I say "go for it" with the skinny jeans... you're 35, not 80... and I would actually stop an 80 year old lady in skinny jeans and say GOOD FOR YOU! I am ready for christmas too! Don't tell, I listened to a christmas cd today! shhhhhhh! hee hee! Just wanted to say thanks for keeping us lighthearted and reminding those of us going through difficult times of the joy of living. Something we should never forget. Doesn't matter what you are going through, decorate your home (with whatever you have) for your family, and the blessing that is will spill back over to you. Life is definitely a gift and the Bible says a merry heart does good like a medicine. So true! Thanks Kelly for keeping those things before us! I can't wait to write my post (it fits in perfect with my Fabulous Fall Fridays, but sadly it will have to wait until this evening after work. I guess someone has to teach those 4th graders today! You may be pleasantly surprised when you put up Christmas decorations. Dillan was the same age as Harper last year and I thought he would be into everything...specifically the tree! He enjoyed looking but never really touched...now this year will probably be another story. HA! I love decorating for autumn. Thanks for hosting this theme ... I am so excited to see everyone's decorations and to show mine! I am with you, I would rather save my energy for the Christmas Decorations. I set up all my Christmas decorations on Veterans day and then take them down the week after Christmas. An idea for Harper this Christmas, buy her her very own fake Christmas tree (like a 2 foot one) and make paper decorations or find plastic ones and let her take them off and put them back on as much as she wants to. They won't hurt her and my kids left my big tree alone when they had their very own so maybe she would too. Just an idea! If you have a Home Depot or Lowe's nearby, they'll gladly help you with your big mums while you handle the little one. 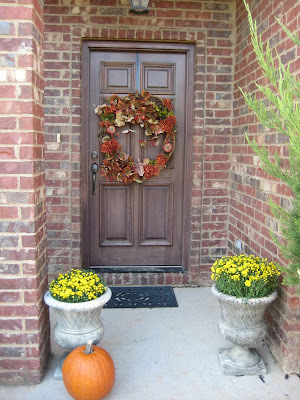 That is a beautiful Fall wreath you have up Kelly! Very cute! I don't have a house to decorate for fall yet, but I can NOT wait to do it! It'll be odd doing it in Hawaii, but I think it'll still be fun! yes yes YES keep the shopping post!! i hardly had enough time to look at one, let alone all of them!! hope you have a great soooooouuuuueeeeyyyyy weekend! go vols, get that tide!! BE prepared! When my kids were Harper's age, they pulled the tree over multiple times! I learned the hard way not to put my favorite breakable ornaments on it until they were a little older. My youngest is 21 months and she only knocked it over once last year and then never touched it again!! I agree I LOVE decorating for Christmas! I have a snowman fetish!! I can't get your little "Show us your life" logo to show up. I'm posting the link in my html page, but it's showing an x where the logo should be. Am I doing something wrong? I also can't wait for Christmas, but I love fall/ Halloween decorations. I love the cute, happy halloween decorations, so do my kids! Kelly, Thanks for sharing so many awesome mom's who make adorable clothing,bows, vinyl signs etc. With 3 kids, 3 and under I do not get a lot of time to go looking for websites. Thanks for sharing!! !